First published in the summer of 1557 - as the protestant martyrs’ pyres blazed across England - Songes and Sonettes, written by the ryght honorable Lorde Henry Haward late Earle of Surrey, and other (more generally known as Tottel’s Miscellany) is widely regarded as the first anthology of English poetry responsible for introducing Italianate verse forms to England. Yet those scholars who have paid attention to the book usually dismiss its literary quality and regard its chief accomplishment as paving the way for the Golden Age of Elizabethan verse to come. As Professor Warner makes clear, however, there is much more historical significance to the Miscellany than merely being a precursor to Shakespeare and Sidney. Drawing upon a wealth of historical, textual and literary evidence, this new study recasts the Miscellany as a peculiar phenomenon of the reign of Mary I. 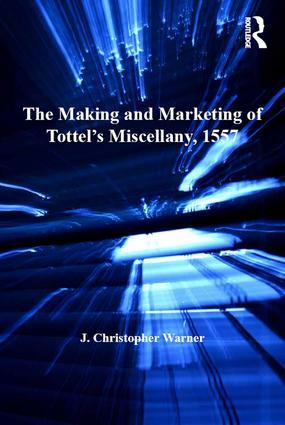 Placing it in the context of its European counterparts and its competition in the London book market, Warner argues that at heart the Miscellany was a collaborative project between the printer, Richard Tottel and law students from the Inns of Court, and represented a timely response to the religious, political and social upheavals of the English Reformation and Counter-Reformation. Analysing from both a literary and historical perspective, this study reconnects the Miscellany with the social, cultural, literary and religious milieu in which it was created. Warner thus reveals not only the distinctiveness of the book’s design compared to other English verse works for sale in 1557, but its function as a patriotic retort to Continental collections of verse -including one that put into print a selection of satirical songs and sonnets written by the Spanish caballeros who found themselves reluctant attendants at the court of Mary I.
J. Christopher Warner is Professor of English at Le Moyne College in Syracuse, New York, USA.